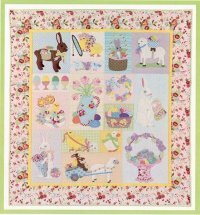 This adorable Easter quilt will add charm to any wall in your home. The sweet appliqued images and Spring colors make you smile. This one is a must have! 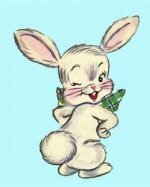 Let this pillowcase become a family heirloom….hopping onto your little one’s pillow every Easter. Sweet dreams guaranteed! Crayon tinted. Make these wool applique ornament tags for Easter and everyone will want one! 3 1/2" x 5 1/2" they are fun and easy to make. Hang them from a chandelier, an egg tree, a wreath or on the wall in a group. This Stitchery folder will hold all of your stitching project's needs! Join us for our annual Easter Egg Basket Sale. Starting Thursday, April 17, through Saturday, April 19, come in and pick one egg from our basket and you will get a chance to win 10% thru 40% off your purchase (sale, Dutch Chintz and Blocks of the Month excluded).